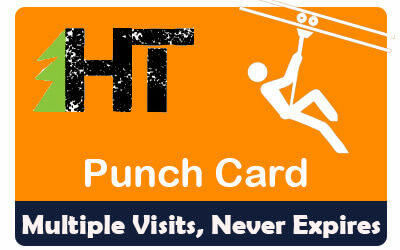 If you are or plan on being a regular visitor to High Trek Adventures, a punch card is the way to go. Unlike Voucher Packs, Punch Cards do not need to be used all in one visit. You can use it for each visit or for multiple individuals. Best of all, Punch Cards never expire, wheras Vouchers expire at the end of the calendar year. Online bookings are preferred for planning purposes but walk-ins are always welcome, space permitting. For available days, view our hours page. For available ticket times, add a ticket to cart. Unfortunately, all punch cards must be purchased in person at the High Trek Adventures Sales Office.